Understanding the form of mineralisation as well as its timing is important in understanding the remarkable preservation of the biota in the Rhynie chert. In this section we shall consider the processes of silicification in hot spring environments and its role in the preservation of organic matter, and also how after burial and time siliceous sinter is converted to chert. In hot spring environments, silica that is precipitated to form sinter is primarily precipitated in the form or phase of silica called Opal-A. As a primary precipitate this form of opaline silica is characteristically amorphous and hydrated with variable amounts of water. For precipitation the hydrothermal solutions must be supersaturated with respect to Opal-A. In the reservoir at depth, the concentration of dissolved silica is controlled by the solubility of quartz (see Williams et al. 1985). It has been calculated that a hydrothermal solution that precipitates Opal-A at the surface at 100oC must contain at least 370ppm dissolved silicon. This in equilibrium with quartz would require a subsurface reservoir temperature of at least 235oC (Hesse 1989). Precipitation of Opal-A at 75oC would require a reservoir temperature of 206oC (see inset below). Above: The 'quartz-geothemometer' is widely applied for hydrothermal systems (based on Rimstidt & Cole 1983). 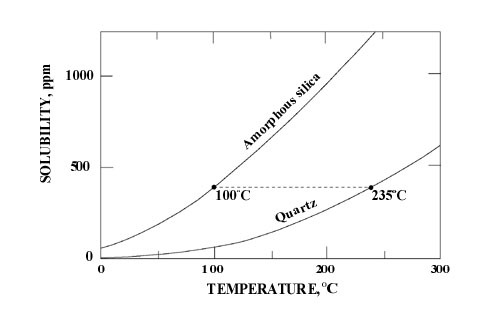 Showing the solubility of amorphous silica (Opal-A) and quartz as a function of temperature. In this example, a hydrothermal solution precipitating Opal-A at 100oC contains at least 370ppm dissolved silicon, in equilibrium with quartz requires a reservoir temperature of 235oC. When the hydrothermal solution, supersaturated with respect to Opal-A, is erupted at the surface from a geyser or out flows from a hot spring it begins to cool and evaporate. The drop in temperature of the fluid and the evaporation of water means the amount of dissolved silica in the fluid can no longer be kept in solution and therefore the Opal-A begins to precipitate. As well as the drop in temperature and evaporation of the hydrothermal fluids, other factors may also affect precipitation such as the pH of the fluids, the presence of other dissolved minerals, the presence of organic matter and even by the mediation of living organisms such as cyanobacteria (e.g. Konhauser et al. 2001). So how are plants and other organic remains silicified in these environments? A lot is now known about the processes of silicification of organic remains, specifically in the case of silicified wood, following experimental studies by Drum (1968), Leo and Barghoorn (1976) and Sigleo (1978). Experiments have shown that the silicification of wood and plant material is a permeation and void-filling processes (or permineralisation) rather than the direct replacement of cell walls (or petrifaction), where the organic structure acts as a template for silica deposition. Polymerization of the silicic acid that has permeated plant cells and organic tissue leads to dehydration and silica precipitation within the cells and openings between cell walls. The silica deposition thus replicates the histological character of the plant. Leo and Barghoorn's experiments suggest that these initial phases of silicification of organic matter may occur in a matter of days to a number of years. For complete and pervasive silicification a high influx of silica-bearing solutions would be required for continued silica deposition. In hydrothermally active areas regular out flows of solutions from hot springs and geysers would provide a suitable flux. It is this rapid and pervasive silicification prior to significant cellular decay that has led to the exquisite preservation of the plants in many of the beds of Rhynie chert. The silicification of prokaryotes has also been studied. Work by Ferris et al. (1988) has shown that for the preservation of cellular structure in microbes, the retention of metal cations, in particular iron, in the solutions prior to silicification is significant. This is because metal cations inhibit cellular decomposition by autolysins. Experiments have shown that bacteria cultures aged for 150 days at 70oC in solutions containing just dissolved silica displayed almost complete cellular collapse whereas cultures treated with dissolved silica and iron retained their cell shape. The retention of iron therefore is important for the preservation of microbial cellular structure before silicification. During burial and over time the amorphous silica phase, Opal-A, that is initially precipitated as sinter becomes unstable and gradually changes in its structure to more stable, ordered, crystalline forms or phases of silica, namely quartz . The diagenetic pathway of silica is controlled by the solubility of the different silica phases. This solubility is primarily a function of crystal structure and size of the different silica phases (see Williams et al. 1985) and usually proceeds from the amorphous, disordered Opal-A through Opal-CT to more ordered, crystalline quartz by dissolution / reprecipitation reactions. The Opal-A to quartz transformation may occur due to a number of factors. With increasing depth of burial, increasing temperatures and pressures are two of the principal factors. The chemistry of pore waters percolating through the sinter may also affect this mineral transformation, particularly if the pore waters are undersaturated with respect to dissolved Opal-A and supersaturated with respect to quartz. As the sinter is being transformed from Opal-A to quartz, percolating silica-bearing fluids may precipitate yet more crystals as a cement infilling pore space and fractures within the rock, depending on the pore water chemistry and concentrations of dissolved silica phases present. Therefore during the conversion of sinter to chert, not only is there a transformation in the form of silica, but also the abundant pore spaces and voids within the original deposit are filled or occluded by more silica so that in many cases the resulting chert has almost no remaining original porosity. For a comprehensive review of the processes and mechanisms for the silicification of fossils and their taphonomy see Carson (1991). For silicification and fossilisation processes in hydrothermal areas see Cady and Farmer (1996).